Back in June, I spoke at VidCon and said, “Traditional influencer outreach works if you’ve got breaking news or the latest Harmon Brothers video.” Well, I guess that I should be careful what I wish for. Today, I got an email from Matthew Faraci of Agility PR Solutions announcing “a brand-new Squatty Potty video campaign created by Harmon Brothers.” Now, I don’t normally write about every story that I’m pitched, but this latest Harmon Brothers-crafted campaign is the best work they’ve done since their 2015 viral sensation that put Squatty Potty on the map. Now, in case you don’t want to Google “Squatty Potty” because you know personal history is used by both Google and Bing to influence search results, here’s be backstory: The creators of toilet stools and toilet spray bathroom products is a fast-growing family business based in Saint George, Utah which has become a worldwide sensation. Featured on Shark Tank and well-known for it’s hilarious, viral social media-driven ad campaigns, the company has sold more than 4 million products in the U.S. to date. In 2015, Harmon Brothers created a now-iconic ad for Squatty Potty called “This Unicorn Changed the Way I Poop”, earning 170 million views in social media to date. Now, I can hear search engine marketing muttering amongst themselves, “Okay, so some funny videos go viral. What did this do for the client?” Great question. Here’s the answer: “This Unicorn Changed the Way I Poop” not only got a ton of video views, it also increased online sales of Squatty Potty by more than 600% and retail sales by over 400%. So, the creators of toilet stools have been laughing all the way to the bank. Today, Squatty Potty launched a brand-new campaign entitled “Discover the Most Pleasurable Way to Poop” featuring new characters “Goldie Drops” The Dragon and The Merman, in the company’s most ambitious campaign to date. In addition to YouTube, the campaign can also be seen on Facebook. Greg Jarboe is the President and co-founder of SEO-PR, a content marketing agency. He’s on the faculty at the Rutgers Business School and Market Motive. 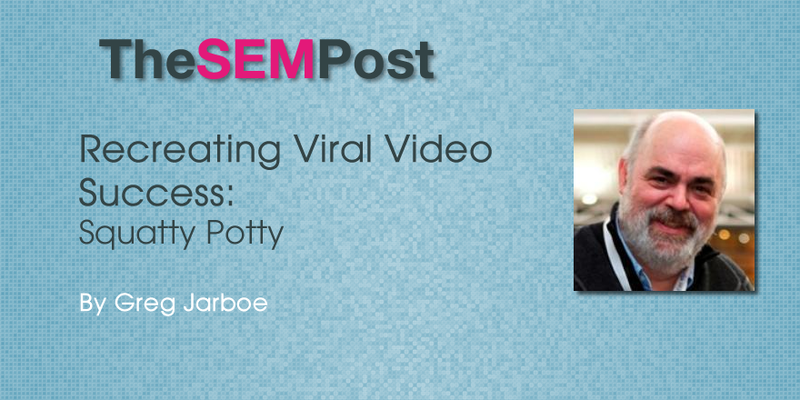 Jarboe is the author of YouTube and Video Marketing as well as a contributor to Strategic Digital Marketing, Complete B2B Online Marketing, and Enchantment. A frequent speaker at industry conferences, he also writes for ReelSEO and ClickZ.